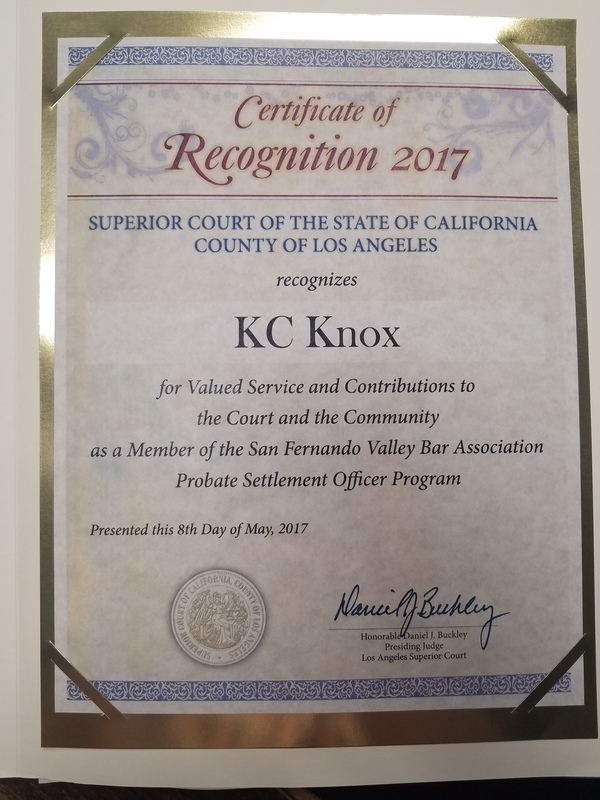 The Superior Court of the the State of California, county of Los Angeles has recognized Attorney KC Marie Knox from the law firm of Hymes, Schreiber & Knox, LLP for valued service and contributions to the Court and the Community as a member of the San Fernando Valley Bar Association Probate Settlement Officer Program. The Pro Bono Probate Settlement Program provides parties with pending probate matters an opportunity to resolve their cases with the assistance of experienced attorney volunteers screened and selected by a committee of local bar associations. We would like to congratulate Woodland Hills Probate Attorney KC Marie Knox on this esteemed recognition. Los Angeles, Woodland Hills, Santa Monica, Pacific Palisades, Malibu, Bel Air, Canoga Park, Tarzana, Sherman Oaks, Encino, Calabasas, Thousand Oaks, Westlake Village, Ventura, Oxnard, Valencia, and throughout Southern California in such counties as Los Angeles County, Orange County, and Ventura County.